My daughter Lauren came over today to help me do some preparation so that her dog could live here for awhile. Boring stuff; so when some friends dropped by for coffee; she took that opportunity to do something more fun and made us an afternoon snack. I had a package of Pillsbury Crescent Flaky Dough Sheet in the fridge that she used to get started and we were all pleasantly surprised at this tasty unexpected offering with our coffee. This would make a satisfying appetizer too and though original recipe on package called for bacon; I had some Rosemary steak in the fridge that was terrific, so think you could substitute a wide variety of meat and veggies for this one. Heat over to 375 degrees. Spray 12 cup muffin tin with cooking spray. Cut dough sheet into 12 squares; fit dough into bottom of cups and partially up sides. Sprinkle half of cheese into cups. Put meat, onion and tomato on top of cheese; salt and pepper to taste. 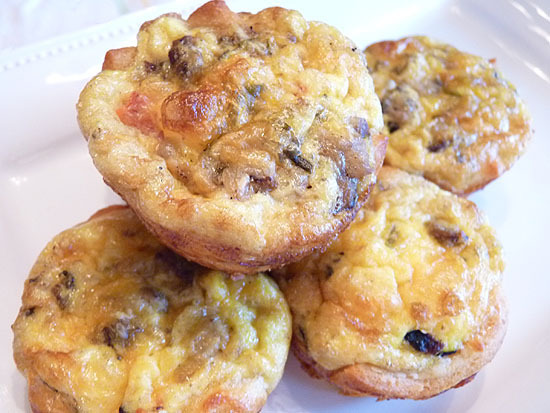 Combine eggs and cream and divide between muffin cups. Sprinkle cheese evenly on top. Remove from tin and serve.